Yesterday as I was cleaning the studio, I came across a couple of watercolor and acrylic paintings, which were works in progress. They were my first attempt to break out of the cyclic creative block that I seemed unable to shake this past week. One of them represented the different emotional and psychological imprints that can happen when one has a chronic illness. The woman figure symbolizes a medical practitioner, the flower in the vintage lab beaker is representative of our creative adaptability and innate biological ability to heal. The bird symbolizes tapping into our own creative and healing energies. 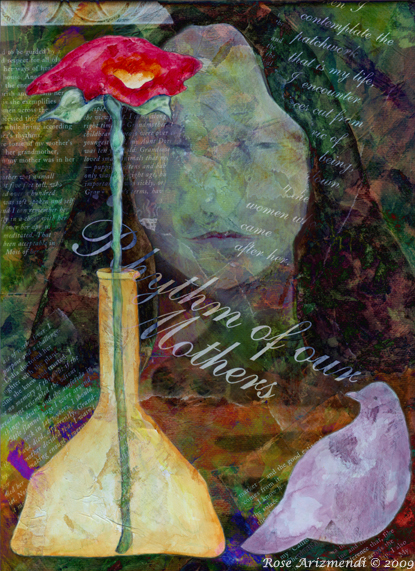 I had covered the other canvas with sections of one of my favorite articles about a grandmother who used plant medicine to heal her granddaughter, and her ability to blend her will with the energies of the earth to nourish and sustain her family. As I looked at these two separate paintings, I suddenly felt inspired to scan both images and thought why not combine both of them together, so I did. I had to cut, rearrange and then merge all the different images to make them fit together. The whole process took me a couple of hours and it really helped me to break out of my creative slump. 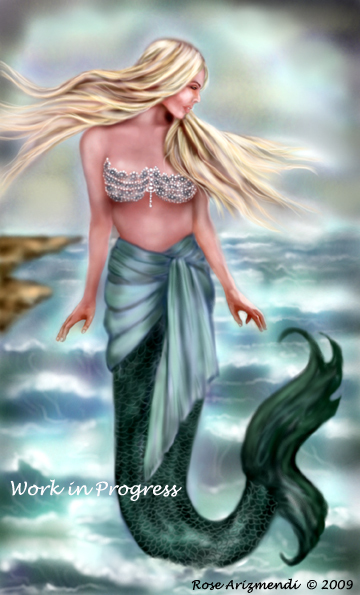 I used Photoshop & Painter IX to create the image above from my original paintings. So here’s a very heartfelt thank you to all the women, mothers and grandmothers who inspire, nurture and sustain us throughout our lives. The studio is dark, silent . . . the easel sits empty. However, in the kitchen, all is well! Cooking relaxes me and engages me in a creative way . . . like blending the right spices or ingredients together. I have homemade chicken curry simmering on the stove, and mangoes, papaya, and peaches in ceramic bowls on the counter waiting to be made into salsa. Yum! My creativity for right now is focused on preparing wholesome, nutritious food for my family. 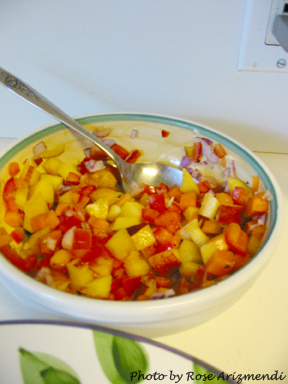 Peach & Papaya Salsa . . .
To make a long story short . . . I’ve been out sick for the past week with a rather nasty upper respiratory infection. I’m beginning to feel much better and am looking forward to getting back to work in the studio. Here is an amazing animation by a young animator, Carmen Bromfield Mason. Over the weekend I discovered some Yupo Paper hidden away on one of my shelves, and I was hoping to play around with it today, but I came down with a nasty flu yesterday. So here I lie in bed surrounded by Kleenex, a big pot of hot tea and various medications which are suppose to help me get through the worst of it. C’est la vie! I’ve been working on quite a few projects lately, and this painting is one of them. At this point, it’s still a work in progress. The preliminary sketch of the mermaid has been floating around in my studio for some time. Every time I came across it I meant to do something with it, but never did. I finally started working on it yesterday and this is as far as I got. . . . I still have a long way to go on this one and a lot of changes are likely going to happen. Copyright © 2000-2019 Rose Arizmendi. All Rights Reserved.